Dude, where’s my Aero Diamond? 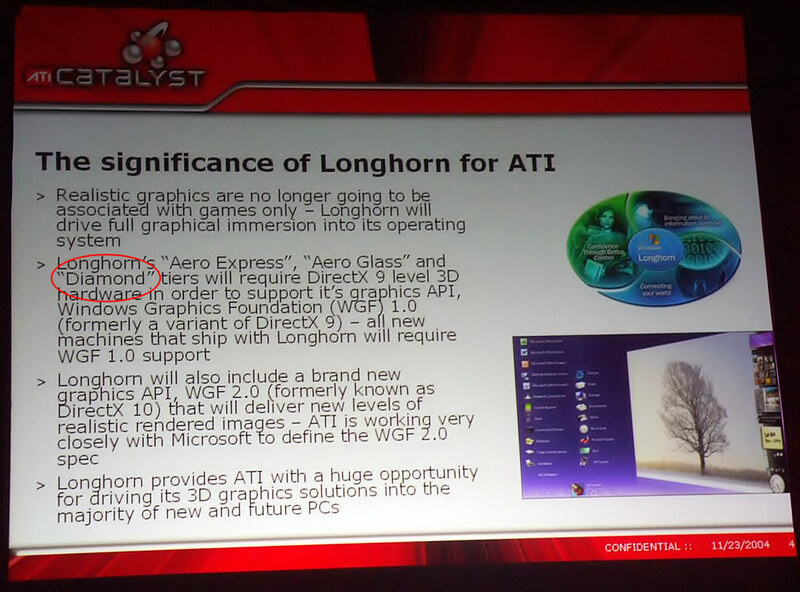 Ever since its first public appearance in an ATI presentation slide back in 2004, Aero Diamond has been the gossip of many Vista communities. It has led to many rumors surrounding its existence; some believe it has been canceled, some believe it is a secret Vista theme in development, some believe it is a vector version of Aero Glass and some believe it is just the codename for the Media Center UI. With Vista launching right around the corner, what is rap on this mysterious UX (user experience) project? At first, Aero Diamond was believed to be the codename for the visual style theme for Windows Vista Media Center Edition. However since both Media Centre and Tablet PC were later integrated into Windows Vista as extensions (as opposed to versions), it would be inconsistent for Microsoft to create an individual theme for Media Center alone. Later, another speculation arose from several Microsoft published documents detailing the different tiers of the Aero experience, one of which was labeled “Aero Diamond”. Aero Diamond was suppose to offer a better user experience compared the now prominent Aero Glass experience, although since no visual imagery of it has been ever released, no one knows what it aimed to achieve or may have looked like. There has been a lot of comparisons made between Aero Diamond and Luna as evidence to suggest it is possible for Microsoft to be secretly developing a theme for Vista. During the development of Windows XP, a ‘cover-up’ theme (we now know as Watercolor) was used in the beta testing phase. This theme was believed by many to be the final XP theme. And only in the last few public betas did Microsoft reveal the Luna theme to the public. The ‘Luna story’ is significant because it shows Microsoft’s ability and tactics to secretively develop an alternative visual style without public awareness, changing user experience or delaying development schedules. Many argue this tactic can be also applied to Aero Diamond, as a theme currently in development and secrecy limited to only the few people designing it. Whilst it is easy to apply the Luna story to Aero Diamond, there is one significant factor that it does not take into consideration. During the development XP, the public was unaware of any other themes in development and thus did not speculate or question Microsoft on the matter. However this time around, the public is aware and questions Microsoft about it, and time after time, official Microsoft sources has confirmed Aero Diamond has been vaporised. Whether or not these official sources are telling the truth or trying to redirect attention remains another question. The future of Aero Diamond looks bleak. It will be highly unlikely for Aero Diamond to make an appearance in Windows Vista. With so much effort being put into Aero Glass, even if Aero Diamond was being worked on, the development schedule will not accommodate for the public testing of Aero Diamond if Vista is still slated for release in January 2007. Having said that, there is still hope. The initiative to create a ‘better’ user experience in the first place will continue even if the visual style has been abolished. And since we’re still in the beta phase, Aero Glass can still change. With already some of those changes taking place, Aero Glass itself can transform into an extremely polished and usable visual style. I have no doubts that Microsoft is ‘design-capable’. Microsoft Design proves it. This team of talented designers has created some very appealing user experiences such as those found in Office 2007, Windows Live, XBOX 360 and even Microsoft Hardwares. With all the constraints and technical limitations placed around them, I am confident that Aero Glass and the whole Windows Vista user experience will match or even supersede today’s UX standards.